When I bought my ticket for last night’s game I thought it would be a possible clinching game for the Warriors, not a possible elimination game. 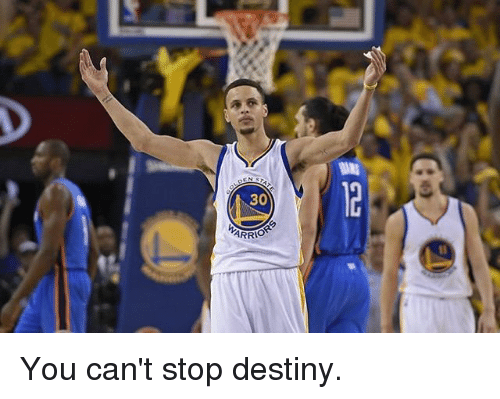 This series against the Oklahoma City Thunder has been a body-blow to the self-esteem of Dub Nation; suddenly our team is back on its heels, struggling to stay alive against a seemingly unbeatable opponent. Or any day, really. But today especially. Error — does not compute. That was a little more like it. 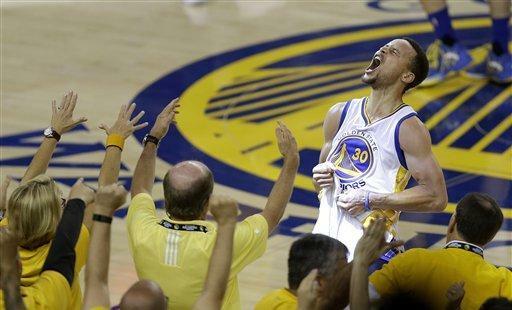 The Nation was in a tizzy the last couple days, as it always is whenever the Warriors do the unthinkable, lose a game. And this time it was a playoff game, at home no less, so of course people were freaking out. I, fortunately, have my “Keep Calm and Curry On” shirt to remind me to keep things on an even keel. But it didn’t help anybody’s nerves in the 1st quarter when Steph Curry chased a loose ball towards the sidelines and went flying into the stands. It was a bad moment for Warriors fans all around — especially those who chose to prioritize their own safety over helping Steph save himself, and most of all the guy who stood over his prone figure taking pictures. Fortunately Steph was fine except for a tennis-ball-sized contusion near his elbow that didn’t seem to affect his shooting ability any. After Andre Iguodala ended the half with his signature move of the playoffs so far — scooping a deflected pass out of midair and somehow calculating the precise number of RPMs necessary to make the ball kiss off the very right-top of the backboard and drop softly through the net — Steph went a little crazy in the 3rd quarter. He scored 15 points in a stretch of less than two minutes, and the Thunder went away quietly after that. Now the Dubs will have to play two games in Oklahoma City, one of the few places that can rival Oakland in the passion and volume of its fan base. And they will need to win at least one of those. Now there’s only 78 hours to kill till tipoff. 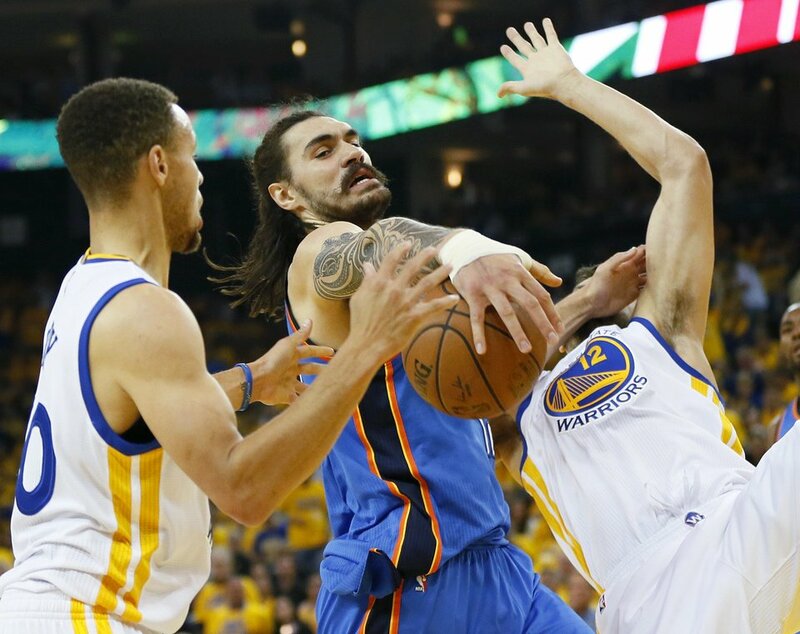 I found this picture on the website NewsOK.com, which captioned it ‘Oklahoma City's Steven Adams (12) is fouled by Golden State.’ Em, wrong on several levels. But it was that kind of night. For some reason, the Warriors’ losses are always a lot less fun to write about than their wins. But this is the task I have set for myself, so here we go. 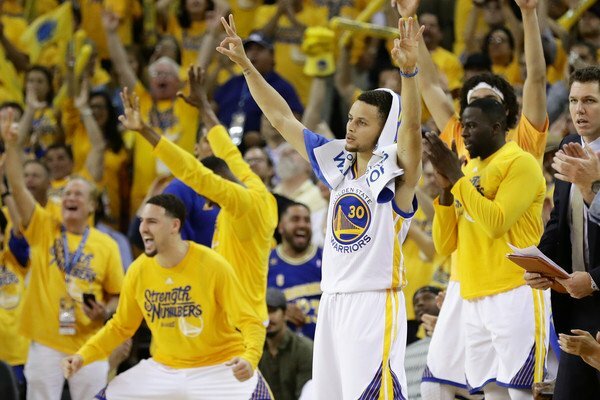 Last night was Game 1 of the Western Conference Finals against the Oklahoma City Thunder. 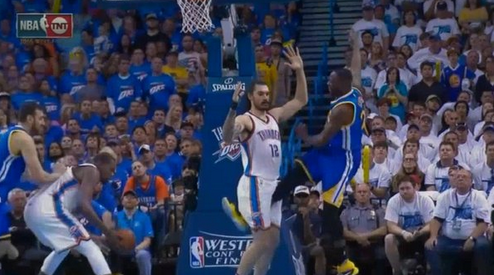 It started well, with Andrew Bogut laying a hard foul on Russell Westbrook in the first minutes of the game. I don’t condone violence, but someone had to set the tone for this series, and Bogut was the guy to do it. The Warriors looked sharp for the whole first half, both on offense and defense, and it ended more or less as it had begun — with Klay Thompson sprinting to try to intercept a pass intended for Westbrook and crashing into him, sending both of them sprawling to the hardwood.